Viper Police Boots which will provide you with comfort and professional look whilst patrolling the street. POLICE BOOT PROVIDING COMFORT AND DURABILITY! 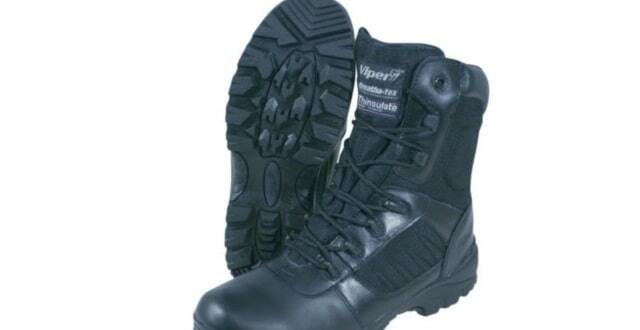 Police Discount Offers bring to you these well manufactured Boots. They are most certainly the best boots you will ever purchase, as they give a professional appearance, offer great comfort in the form of 4 x insoles which are also anti bacterial! and have waterproof breathable latex lining! What more would you need from a Police Boot? The VIPER TACTICAL BOOT is made of 1200D Nylon and has full grain and action leather uppers. The laces come completed in the form of a non-metallic speed system and there are sizes from 4-13 available. Lastly they a durable slip/oil/ resistant sole for all those difficult police chases!